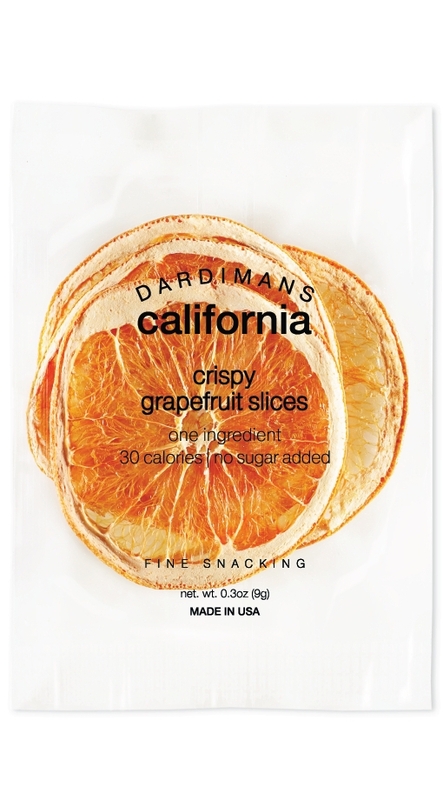 This snack is dedicated to those fruit lovers who adore that signature bittersweet flavor only grapefruits offer. Grapefruit crisps are best paired with salads, honey, brie and gouda. NUTRITION FACTS nutrition facts serv. size (9g), serving per bag (1), amount per serving: calories 30, fat cal. 0, total fat 0g (0% dv), sat. fat 0g (0% dv), trans fat 0g, cholest. 0mg (0% dv), sodium 0mg (0% dv), total carb. 8g (3% dv), fiber 1g (4% dv), sugars 6g, protein 1g, vitamin a (8% dv), vitamin c (10% dv), calcium (2% dv), iron (0% dv). percent daily values are based on a 2,000 calorie diet.